The American Eskimo Dog is an intelligent, mischievous dog who is thrilled at any opportunity to entertain. The Eskie was originally known as the German Spitz, and is related to the modern German Spitz. There are three sizes included in the American Eskimo Dog’s breed standard: toy, miniature, and standard. Whatever the size, this spunky dog needs plenty of exercise and attention to prevent boredom—a bored Eskie can be destructive. This smart breed needs an owner who is consistent in training and doesn’t give in, but Eskies are mischief-makers—so a sense of humor is imperative. American Eskimo Dogs are also called Eskimo Dogs and Eskies. Prior to the 1920s, the breed was called the American Spitz—and prior to that, the German Spitz. Coat - The thick, dense double coat of the American Eskimo Dog may be white or white with cream. The American Eskimo Dog was originally called the German Spitz—a breed descended from ancient Viking dogs with a history spanning centuries. In America, the breed name was changed to American Spitz, and then to American Eskimo Dog after World War I. This popular family companion and farm dog came to the US when families immigrated from Germany, but popularity surged when the breed began appearing in circuses. One famous Eskie, Stout's Pal Pierre, traveled with Barnum & Bailey as a tightrope-walking dog in the 1920s and 1930s. Exported American Eskimo Dogs are often registered as German Spitz Gross or German Spitz Mittel—standard or miniature, depending on size—as American Eskimo Dog isn't recognized by many kennel clubs outside of America and Canada. Though numerous American Eskimo Dog clubs popped up after 1970, the American Kennel Club didn’t recognize the American Eskimo Dog until 1995. The American Eskimo Dog is a master entertainer—the friendly dog knows how to earn a few laughs and will perform at any opportunity. They’re smart and determined, and not above manipulating people to get what they want—which is usually more treats or a second dinner. Though they may take a little while to warm up to strangers, they treat everyone in a friendly manner. New people are simply an untapped audience and an opportunity to show off. Are American Eskimo Dogs Good with Kids? Eskies are polite and gentle with children, and they have plenty of energy to play. The incredible energy level keeps them going all day, but can be overwhelming for small children who may be knocked over by spirited bouncing. Are American Eskimo Dogs Good with Other Pets? Other dogs are often fine with American Eskimo Dogs. While friendly, Eskies may chase animals smaller than they are. Dog-experienced cats may be able to live with an Eskie, but playful games of chase—whether the cat is interested or not—are likely. Rodents and rabbits aren't ideal matches due to the Eskie's high prey drive. American Eskimo Dogs are fantastic watchdogs—they're alert and will bark to warn you of the approach of strangers, friends, and wildlife. They're wary of new people, but are friendly. While they'll sound the alarm when someone new approaches, Eskies aren't suitable guard dogs. The American Eskimo Dog is an active, high-energy dog who requires lots of exercise. Eskies will bark—it's in their nature. Without enough exercise, American Eskimo Dogs may become destructive. Their heavy, double coat will shed. Eskimo Dogs like to eat and are prone to obesity. This crafty breed often outsmarts owners. They may chase smaller animals due to their high prey drive. Physical exercise isn’t enough—the Eskie also needs to exercise his mind. Indoor American Eskimo Dogs are excellent indoor companions if they have the opportunity to get outside to burn energy. They can adapt to many living situations, including apartments, but the breed’s tendency to bark may put a strain on relationships with neighbors. Outdoor The outdoors is where an Eskie loves to be—as long as he is accompanied. This sneaky breed may wander, so a solid recall is important and fenced areas may be necessary. Eskies love snow and will romp in it for hours. Though he is built to withstand inclement weather and loves the outdoors, an Eskie’s personality requires that he live indoors with his people. If left outside, he may bark, dig, or become excessively withdrawn. Exercise An active lifestyle is ideal for the Eskie. He needs at least an hour of exercise per day. This may include some indoor play and brain games, but he needs to get outside to run in order to get enough exercise. Endurance American Eskimo Dogs are sturdy, high-endurance dogs. An Eskie may have the stamina to outlast his owner. Running Miles: An American Eskimo Dog in good health may be able to run up to five miles. Hiking Miles: The trail is an Eskie’s favorite place to be. Full-day hikes are no problem for this robust breed, but plan to take water breaks to prevent overheating. An Eskimo Dog never passes up mud, streams, and ditches, so keep towels in the car and expect a muddy ride home. Food American Eskimo Dogs are prone to overeating and are highly food motivated. The breed responds well to treats during training sessions. The recommended diet for most American Eskimo Dogs is about ½ to 2 cups of high-quality dry food daily, based on the dog’s average weight and activity level. This amount should be split between two meals. A food-dispensing puzzle toy can help exercise his brain while he works for his food. American Eskies do not tend to guard their food more than any other breed, but children should never be allowed to touch or remove food while any dog is eating. Alone Time An Eskie’s favorite place is with his people. Though he can be left home alone for as many as five to eight hours, an Eskimo Dog may become destructive if bored or not given enough exercise. Barking is natural for this breed and thus he may bark when left alone. Providing plenty of exercise and mental stimulation can help prevent barking and destructive behaviors, but crate training may be necessary. Eskies have a thick double coat that sheds a lot, but requires little grooming. Weekly brushing will prevent matting and cut down on fur around the house—daily brushing may be necessary during seasonal shedding periods. Bathing should occur only as necessary to prevent skin irritation. Trimming nails regularly will help prevent painful splitting, cracking, or a broken nail. 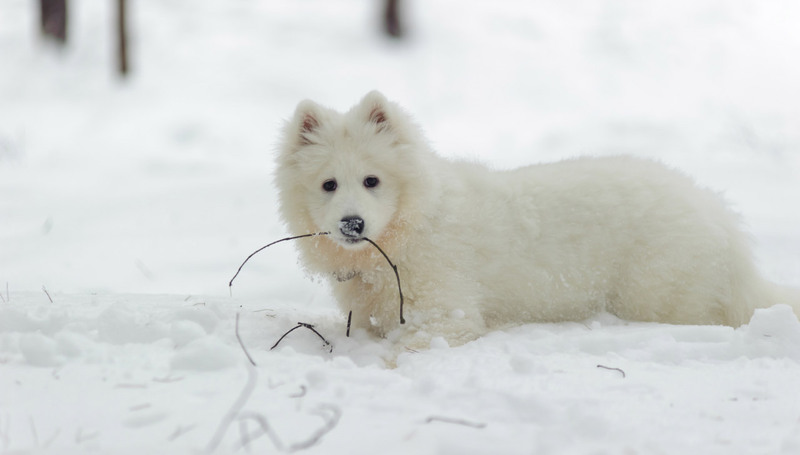 You can minimize serious health concerns in an American Eskimo Dog by purchasing him from a reputable breeder who engages in responsible breeding practices, and through screening for common diseases and conditions. Intelligent, eager-to-please American Eskimo Dogs learn basic obedience with ease. They respond well to treats, and learn best through fun activities rather than boring repetition. If they’re bored, they simply won’t listen. Though you’ll never train an Eskie not to bark—it’s a natural behavior for this spitz-type—you can teach him to go to his dog bed when the doorbell rings to reduce the excited behaviors that come with guests. Good leash manners are also a priority, as Eskies are masters at collar-slipping. As a former circus dog, the American Eskimo Dog is a natural at advanced tricks and obedience training. Agility, disc dog competitions, rally, and other high-energy competitions are activities at which the American Eskimo Dog excels. Though not a hunting dog, American Eskimo Dogs may do well in barn hunt events, as they have a keen nose and high prey drive. Can American Eskimo Dogs handle hot weather? Eskies are built for snow and cold, but they can handle hot weather with considerations. The Eskie’s fluffy coat insulates him against hot weather and shouldn’t be shaved in the summer. And while some hot weather is fine for Eskies, extreme temperatures may be too much for this cool-weather-loving breed. He will need plenty of water in hot weather or while participating in strenuous activities, access to shade while outdoors, and air conditioning or fans indoors. Can American Eskimo Dogs pull sleds? Though they have plenty of energy, American Eskimo Dogs are not sled dogs. They were bred as companions and are better suited to entertaining their adoring fans rather than pulling sleds. What's the difference between a Canadian Eskimo Dog and an American Eskimo Dog? Canadian Eskimo Dogs and American Eskimo Dogs are different types of dog with separate breed development, but a similar name. Canadian Eskimo Dogs were developed in North America thousands of years ago from dogs brought from Siberia, while American Eskimo Dogs are a more recently developed breed descended from the German Spitz. The dogs have similar characteristics, but do not share a history. The Canadian Eskimo Dog is not recognized by the AKC, and there are very few of the type in existence today.